Add the possible cracktastick plotline to my new obsession with Kim Young Kwang as a leading man? My expectations were through the roof. Unfortunately, more information has come out and now my feet are back on the floor and I’m looking at the wreckage of my ceiling. Why my disappointment? While the drama is still a disaster drama, it actually takes place in a hospital with all of the characters being hospital personnel. Which means it’s not so much a disaster drama as it is a medical drama. What a disappointment. It’s not like medical dramas are all terrible but haven’t we been there, seen that? How will this be that more different from other medical dramas? 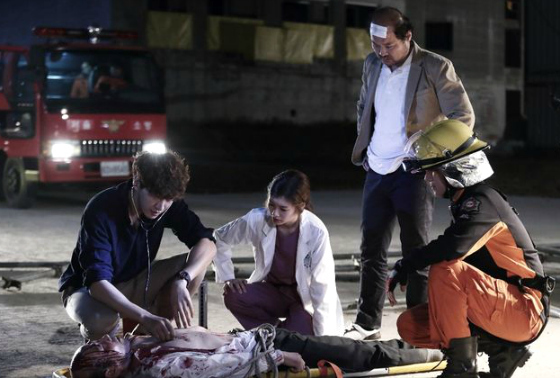 Yes, this will be set during a time of disaster, but all the medical dramas have some sort of spin on the old story–Brain was all brain surgeons, New Heart was cardiology, Doctor Stranger…who knows what the hell that was. So we’ll have the same sort of plotlines, the headstrong doctor hero bucking the system doing whatever he needs to in order to save his patient, the other guy who is his medical or administrative rival/antagonist, the heroine who, more often than not is a newbie who’s a little awestruck by our hero, and then let’s not forget the bucketloads of office politics. Wouldn’t it have been a more interesting plot if they’d mixed it up a bit? Dabbled in characters in all the professionals dealing with this crisis? Then connecting them all in some way? I guess I understand why they might go it this way as one location (the hospital) is probably easier and ultimately cheaper to base a drama around.